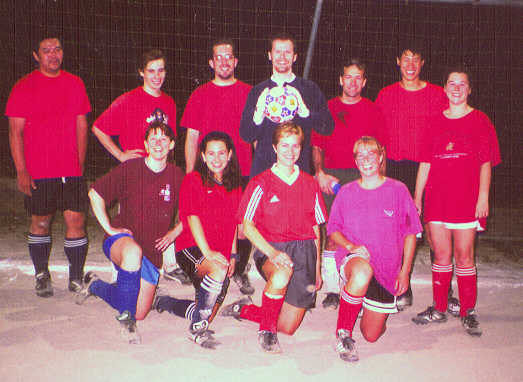 I played a little soccer in high school and had been missing the comradery of a team sport. After I moved out to Seattle, some friends of friends were playing on adult league teams. I subbed with them in a game and, through being on the subs e-mail list, I found a team that was starting up and signed on. Then, I liked it so much that I joined a second team. My Tuesday team is called the A-Dash, since most of the members were contractors at Microsoft and their e-mail addresses all started with a-. On our shirts, though, it looked more like a-minus! My Thursday team is called Not Yet, since that was the answer when the league asked our manager if he had a name for us. Not Yet: (front) me, with the sunburned nose, Melanie, Melissa, Christy. (back) Emory, Mike, Bill, Matt, David, Nathan, Suzanne. We play in the Washington State Soccer League. There's also the Greater Seattle Soccer League. The rules that the leagues follow are a little different, and the games are played with the understanding that we all need to get up and go to work the next day. The GSSL's web site has a lot of interesting links, including a "You make the call" (Whistleblower) section and directions to all the different fields here in Seattle where we play. The WSSA pages seem to have been updated since I last checked, and they have a good listing of links as well. Well, maybe calling this page "Soccer Links" is a false advertisement, since I don't have many links now. There are better links from the WSSA and GSSL pages than I will compile, but feel free to send me links to add. Over time, I'll try to get some pictures of my team(s) here. Oh, yeah -- apres futbol, we like to go either to the Rose Hill Ale House in Kirkland, or to Dante's in the U-District. Rose Hill has a great micro-brew selection, good food, and is non-smoking. Dante's is a college bar, so there are good prices, but it's a little smoky. Both places have good food at reasonable prices. We also frequent Grady's, since it's convenient to both Seattle-ites and East-siders, their food is good, and the kitchen's open late. They've also been known to give a "team discount" off pitchers -- imagine, being rewarded for walking into a pub all dirty and smelly!